iOS 10's new lock screen has caught many users off-guard but overall, the interface provides access to an abundance of useful info at a glance. For baseball fans, MLB At Bat has just been updated with a bunch of features tailored to the iDevice lock screen UI, including latest scores and even video highlights. If you're big on baseball, this is quite a significant update. The app will keep you in the loop with all of the latest scores and news as it breaks, as seen above. If you're a fully paid-up subscriber, you'll also be able to check video clips from the comfort of your lock screen. Essentially, you don't really need to open the full app ever again. 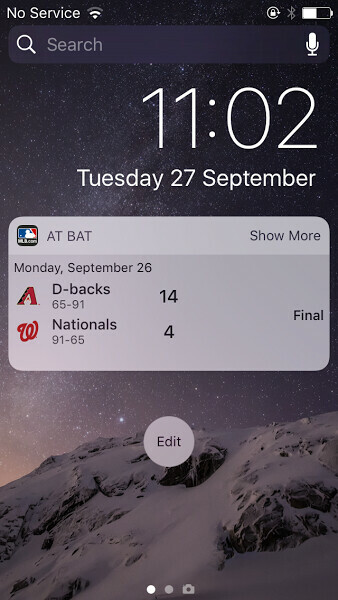 MLB is the latest in a series of apps to have reaped the benefits of iOS 10's new-found lock screen capabilities, with many more to follow in the coming weeks and months. If you like to keep updated on all things baseball, you can download the app for free below. Wow, this is cool! I'm not subbed so I guess no video highlights for me. I do like being able to see the score on the screen though.